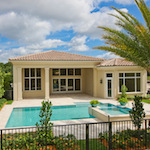 The interior design is now complete on two new models in Old Palm Golf Clubâthe Poinciana II in the Golf Estates neighborhood, and the Ashford in the Grand Estates. Built by Courchene Development Corporation, the 3,485-square-foot Poinciana II features an interior design by Insignia, Courcheneâs in-house interior design company. The homeâs traditional split floor plan offers three bedrooms, three full and one half bath, a library and a spacious great room that opens onto a covered loggia. To maximize views of the tropical landscaping, the Poinciana II has been designed with plenty of windows and sliding doors for a seamless flow between the indoors and outdoors. While this Poinciana II on Pink Oleander Lane overlooks a private water feature, the model can be built elsewhere in the Golf Estates. It is priced at $1,680,000 fully-furnished or can be built for $1,320,000 on a standard preserve home site. Hasey Construction built the newly furnished Ashford in the Grand Estates, entrusting the interior design to Teri Palomino, who provided the same services on a previous Ashford. The Ashford features a traditional split floor plan that sprawls over 6,394 square feet and boasts five bedrooms, six full baths, two half baths, a loft and a club room. The Master Suite occupies one entire side of the Ashford, and three of the bedrooms are upstairs for added privacy. The family room, kitchen and breakfast area beautifully flow together in one large expanse that feels even more spacious because of the abundant windows and two sets of French doors that open onto the covered veranda. The home is beautifully situated on a half-acre home site overlooking the finishing holesânumbers 9 and 18âof Old Palmâs Raymond Floyd-designed golf course. Views are especially panoramic from the second floor, which can be accessed by stairs or elevator. The furnished Ashford can be purchased for $3,950,000 or can be built on another homesite within the Grand Estates starting at $2,750,000.